Conveyors – Gravity Roller – BNB Industries, Inc. 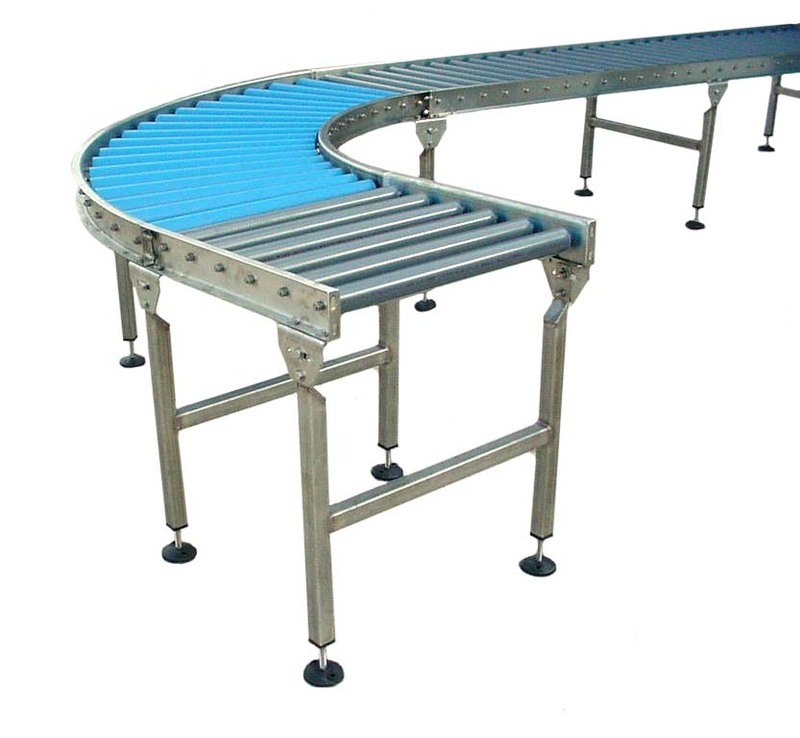 Gravity Roller conveyors are used to convey packages in warehousing or manufacturing activities, shipping departments or assembly areas. Most products will convey with a minimum amount of pitch or slope. 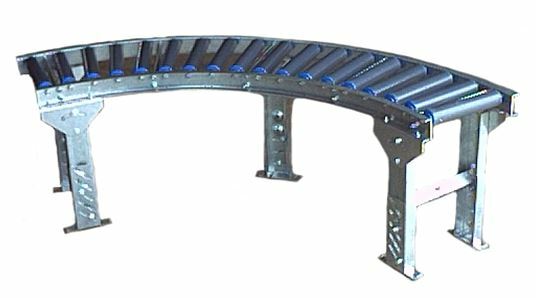 are a light weight conveyor for non powered application. 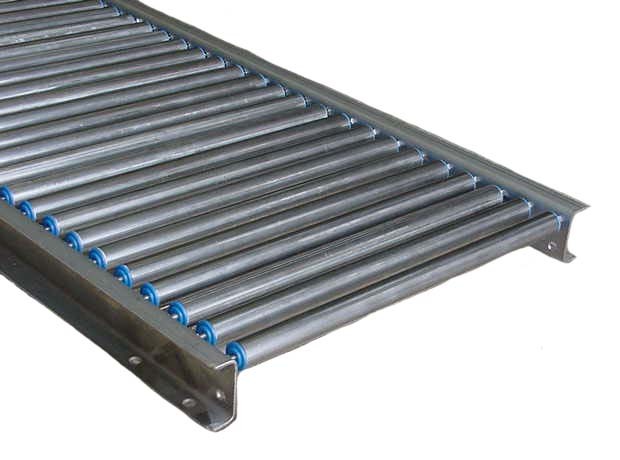 Steel or aluminum rollers are used for greater carrying capacity than wheels. Rollers are recommended for uneven, open packages, wire baskets or totes that have a bottom rim. 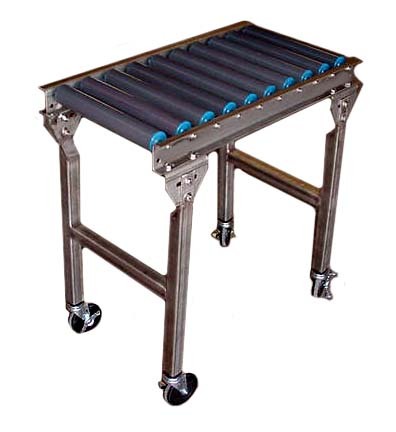 The light weight construction of these conveyors makes them ideal for loading trucks with the conveyor set up on removable stands or supports. 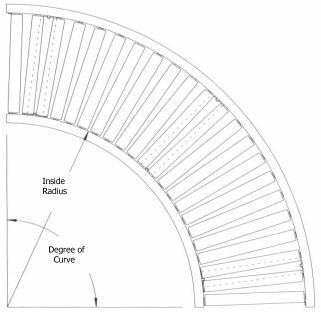 Curved Sections: 45 deg and 90 deg curved sections available. 4′ Outside RadiusRollers: 1-3/8″ OD with 1/4″ dia. spring loaded shafts. 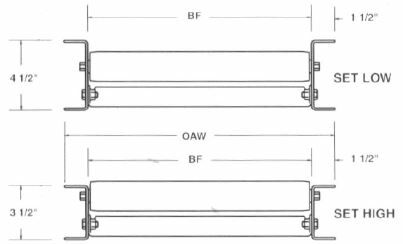 Frames: 2-1/2″ x 1″ x 12 ga. zinc plated steel or 2-1/2″ x 1″ x 1/8″ aluminum, formed channel. Frame capacity: Aluminum 160 lbs. max. distributed live load per 10’ section or 750 lbs. per 5’ section – Galv. steel 350 lbs. max. distributed live load per 10’ section, or 1300 lbs. per 5’ section. are for non powered application. 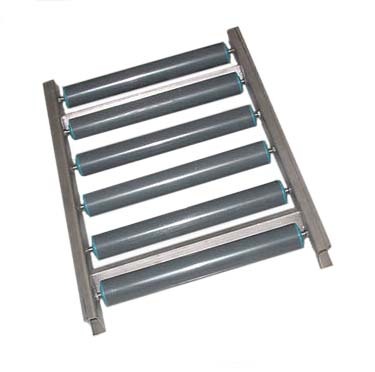 Steel rollers are used for greater carrying capacity. Rollers are recommended for uneven, open packages, buckets, small pails, wire baskets or totes that have a bottom rim. 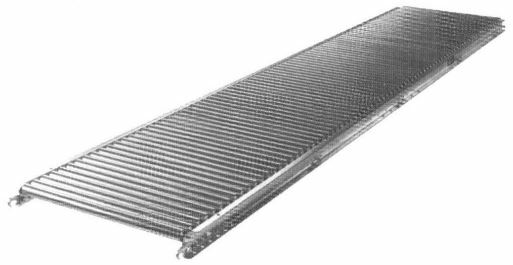 These conveyors are ideal for conveying packages in warehousing or manufacturing activities, shipping departments or assembly areas. 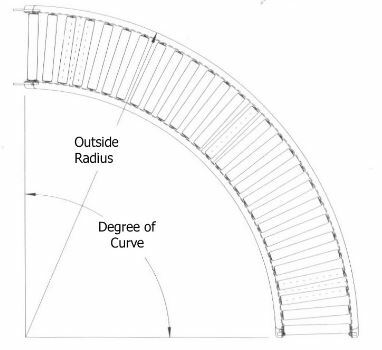 Curved Sections: 45 deg and 90 deg curved sections available. Rollers: 1.90″ OD with 7/16″ hex spring loaded shafts. Frames: 3-1/2″ x 1-1/2″ x 10 ga. (set high) or 4-1/2″ x 1-1/2″ x 10 ga. (set-low) formed channel. Frame capacity: 1300 lbs. max. distributed live load per 10’ section, or 3200 lbs. per 5’ section.